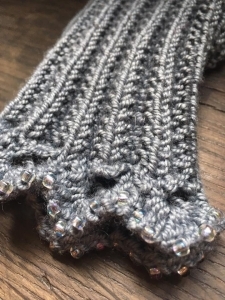 Simple and very fast to knit, these elegant mitts are also highly practical and easy to wear. The pretty beaded cuff is fun to work and once you start the main mitts, the whole thing is knitted in a moss stitch rib, which makes them very comfy and suitable for most sized female hands. I rate these as easy – moderate. 2 x 50g balls (or approx 200m) of DK yarn. For example, Juniper Moon Farm Findlay DK, Debbie Bliss Rialto DK, Rowan Pure Wool DK, Rowan Baby Merino Silk DK.